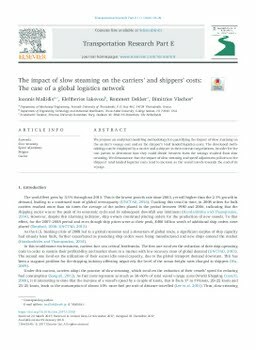 We propose an analytical modeling methodology for quantifying the impact of slow steaming on the carrier's voyage cost and on the shipper's total landed logistics costs. The developed methodology can be employed by a carrier and a shipper in their contract negotiations, in order for the two parties to determine how they could divide between them the savings resulted from slow steaming. We demonstrate that the impact of slow steaming and speed adjustment policies on the shippers’ total landed logistics costs tend to increase as the vessel travels towards the end of its voyage.